Review Summary: On the whole YEH RAASTE HAIN PYAR KE is a pleasant surprise for those who aren't expecting much from this enterprise. 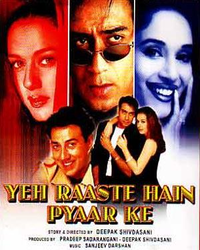 Yeh Raaste Hain Pyaar Ke is a star-studded love triangle starring Madhuri Dixit, Ajay Devgan and Preity Zinta. On the whole YEH RAASTE HAIN PYAR KE is a pleasant surprise for those who aren't expecting much from this enterprise. Deepak Shivdasani’s multi-starrer Yeh Raaste Hain Pyaar Ke sets out to explore love and relationships in a new light.